But in the case of this drink, The Desert Sunrise, and many others that will be posted, you don’t necessarily have to have prickly pear to have a better morning after or “sunrise”. But you do need to have fresh Orange Juice and use a small batch tequila or mezcal. You will be pleasantly shocked at the difference using fresh squeezed makes. If you can’t find the Prickly Pear, there are several companies making organic grenadine. By the way grenadine is made from everyone’s favorite antioxidant laden fruit Pomegranite. Prickly Pear Cactus Serum (see Dr. J’s Prickly Pear Serum Page) or Grenadine (yes there are several organic grenadines out there, Google it). 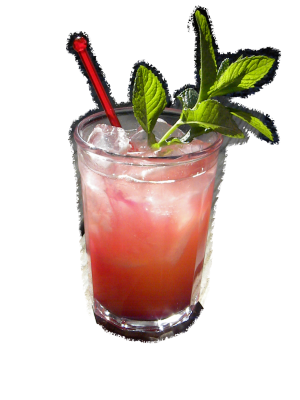 In a tall glass filled with ice, add the tequila and the Prickly Pear (or grenadine). Top off the glass with OJ. You can garnish is with Orange slice, but in this case, the fresh mint made a great contrast to the red swizzle stick. When you are ready to drink it, slowly stir the drink and watch the sunrise on the desert.